Aquatic macroinvertebrates are sensitive to changing environments and can have cascading effects on trophic levels. Habitat alterations to accommodate barge traffic, such as dredging and channelization, likely influence macroinvertebrate community structure, and subsequently a range of potential ecological interactions. Understanding baseline differences between highly modified and relatively natural segments of the Minnesota River has become a higher priority as existing challenges intensify (e.g., changing hydrologic patterns) and new threats emerge (e.g., invasive species). Therefore, we assessed aquatic macroinvertebrate species richness and density between the lower modified section and the more natural mid-portion of the Minnesota River. Macroinvertebrates were collected with sled nets and light traps from May until August of 2014. Based on disturbance levels that influence the homogeneity of habitats available, we hypothesized that the substantially modified portion of the Minnesota River would have high densities, but from few species, whereas, the more natural areas would have lower densities, but greater species richness. Although we compared a modified riverine segment with an unmodified segment, we must acknowledge that the modified segments were in the lower portion of the basin and the unmodified segments were in the middle portion of the system. Therefore, we also considered the natural changes that occur along the longitudinal gradient. Results were largely as we anticipated; however, we now put our findings into perspective with the challenges and threats facing the Minnesota River. Dahmes, Alexandra. "Macroinvertebrate Species Richness and Density Between Modified and Relatively Natural Segments of the Minnesota River." 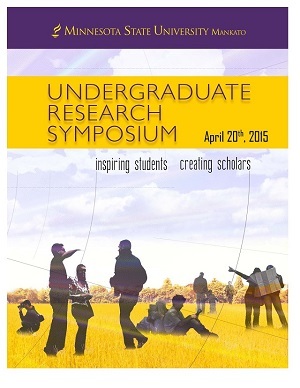 Undergraduate Research Symposium, Mankato, MN, April 20, 2015.